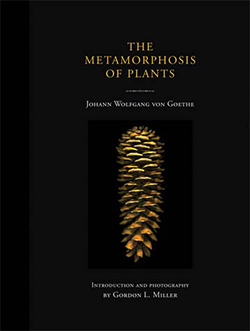 In The Metamorphosis of Plants, Goethe turned to botany — because sometimes, poetry isn't enough. Gloom rains down during early April days in the north. The sky is heavy and stuffed with shadows. A goldfinch at the bird feeder looks ridiculous; his molting winter feathers are a wreck. Everything about his half-golden face says hope, the uncombed horror of hope. This is the time we look for anything that reminds us of life. These are the days of stick-seeking and leaf-hunting, of changing our eyes into microscopes. On the windowsill, a slug; under a pile of leaves, an infinitesimal green something. Eliot was so right about April and its cruelty.